Between the one-stall restroom and the service elevator on the third floor. 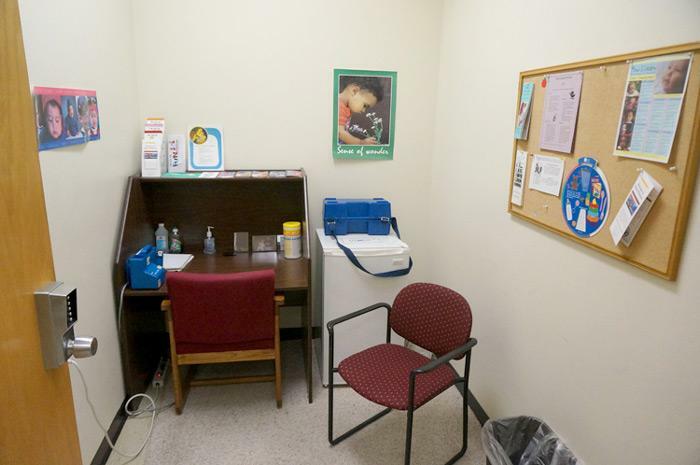 Virginia Tech University states: Women seeking a quiet, clean, and private space to pump breast milk are able to use room 3048 of Newman Library. This room is located in the new section of the building, between the one-stall restroom and the service elevator on the third floor. You need to get a keycode number to use the room. Stop by Reference Desk on the second floor to get one. Please register with Hokie Wellness before using any Virginia Tech nursing room. Do not give the pass code to anyone who has not registered. Women should sign up for time slots in the notebook provided in each room. It is only necessary to sign up a week or two in advance. If you need to use the room at a time that you have not reserved, and it is available, please add your name after the fact. This room is for you. Feel free to put up baby pictures on the bulletin board, post messages to others, or bring in articles or magazines for others to share. If the room needs cleaning, contact housekeeping services for the building. With other problems, notify Hokie Wellness or the building contact listed with individual room pass codes details. Some rooms are equipped with hospital grade Lactina pumps. If you use a pump, please wipe it down with an approved solution after each use. The personal accessory kit for the Lactina pump is available by calling the MRH Lactation Consultants at 540-953-5409. If the pump is not working correctly, call Hokie Wellness for advice: 540-231-1228. All students and employees are eligible to use these rooms. We do ask that you register with our office. It is important that we keep track of users for reporting purposes, as well as quality control.